Fomalhaut (usually pronounced "foh'-mah-low") is the 18th brightest star in the sky. It's a first magnitude star, 14 times more luminous and about twice the diameter of our sun. From the earth Fomalhaut is 23 light years away, located at the mouth of the Southern Fish, Piscis Austrinus (also known as Piscis Australes), in the region of the southern autumn sky. In the heavens the fish can be seen drinking water flowing from the jar of Aquarius ~ old pictorial sky maps depict the Southern Fish drinking the water flowing from the jug of Aquarius. Other stories credit the stellar fish swallowing the waters of the great deluge, thus saving the world. Because it contains the first magnitude star Fomalhaut, Piscis Austrinus is more noticeable in the night sky than the zodiacal constellation Pisces. It has also been referred to as the Solitary One, for there are no other bright stars located in its proximity. The name Fomalhaut comes from the Arabic meaning Fish's Mouth, which is how Ptolemy described it. During the Persian empire circa 3000 B.C., Fomalhaut (along with Regulus, Aldebaran, and Antares) came to be known as one of the four royal stars of the heavens, seen as the sentinels watching over other stars. These four stars have been used as navigation points thoughout the centuries. As the Watcher of the South, Fomalhaut then marked the winter solstice, whereas now it culminates at midnight at the end of August. Fomalhaut, one the "Four Royal Architects," [Royal Stars] inspires future vision for an evolved humanitarian-based society. 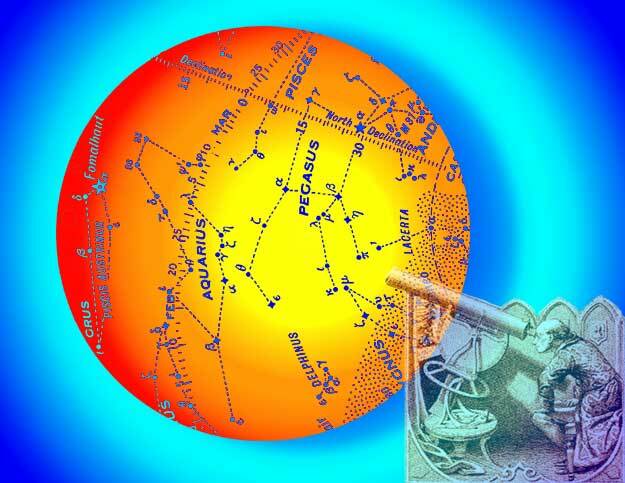 Fomalhaut inspires new ideas and pursuits in the art-sciences, in technology, and in social issues of the world. Fomalhaut promotes the flow of resources within the human populous that creates a wholesome human condition. Fomalhaut defies convention and compartmentalization, but supports individuality, progress, and freedom. Though some sources have described Fomalhaut as a reddish star, it is classified as a Blue / White Class A star (as are the stars Vega and Deneb). Perhaps it is because the area surrounding it is largely devoid of bright stars that, along with the stars near 12 degrees of Gemini ~ Aldebaran and the Pleiades ~ Fomalhaut has been associated with immortality. Fomalhaut was equated with the Persian god Zal, and is said to bestow charisma and to engender the test of remaining true to our ideals. Ptolemy likened Fomalhaut's nature to that of Venus and Mercury, while Alvidas associated the Southern Royal Star with the squaring of Jupiter and Saturn, from Pisces to Sagittarius. Traditionally this star is held to be quite variable in effect ~ either very good or very bad, depending on the overall cosmic structure. In Greek mythology, Fomalhaut was associated with the monster Typhon, who is said to lie buried beneath Mt. Etna in Sicily. In Syrian and Canaanite lands it was honored as the symbol of the fish-god Dagon, whose temple at Gaza was destroyed by the Biblical strongman Samson. This temple is believed to have been oriented to the rising of Fomalhaut. All accounts of this constellation's mythology are rather sketchy. Like Pisces, its mythology has a Middle Eastern setting indicative of Babylonian origin. An ancient constellation, Piscis Austrinus represents the Babylonian fish-god Oannes, who came to Earth to teach humans how to become civilized. According to the brief account of Eratosthenes, the Syrian fertility goddess Derceto (the Greek name for Atargatis) is supposed to have fallen into a lake at Bambyce near the Euphrates river in Syria, and was saved by a large fish. Hyginus says, in repetition of his note on Pisces, that as a result of this the Syrians do not eat fish but rather they worship the images of fish as gods. Bambyce later became known to the Greeks as Hieropolis (meaning Sacred City), now called Membij. Other classical sources tell us that temples of Atargatis contained fish ponds. The goddess was said to punish those who ate fish by making them ill, but her priests ate fish in a daily ritual. According to the Greek writer Diodorus Siculus, Derceto deliberately threw herself into a lake at Ascalon in Palestine as a suicide bid in shame for a love affair with a young Syrian, Caystrus, by whom she bore a daughter, Semiramis. Derceto killed her lover and abandoned her child, who was brought up by doves and later became queen of Babylon. In the lake, Derceto was turned into a mermaid, half woman, half fish. So merpeople may also be associated with the constellation Piscis Austrinus. Eratosthenes called this the Great Fish, and said that it was the parent of the two smaller fishes of Pisces, The Fishes. One writer speculates, "As such, swallowing Osiris's creative appendage may well be a precessional symbol of the shift from the age of Aries to the age of Pisces." And now, Fomalhaut (and Piscis Austrinus) are closely associated with the shift of ages from Pisces to Aquarius as this star is located near the cusp between the two signs, at 4 degrees of Pisces. About 500 B.C. Fomalhaut was the object of sunrise worship in the temple of Demeter at Eleusis, where secret, spiritual ceremonies were held, about 22 kilometers from Athens. This association echoes a theme of death and rebirth, both of which are implicit in the significance of this royal star. In the first century A.D. Manilus wrote of Fomalhaut, "When the Southern Fish rises into the heavens, leaving its native waters for a foreign element, whoever at this hour takes hold of life will spend their years about seashore and riverbank." Other significances connected since antiquity to the star include fortune and emanance, and it is considered powerful and fortunate in its aspecting of other heavenly bodies. And yet, as Fomalhaut is said to influence changes from material to spiritual forms of expression, there is also associated with this star's powerful emanations a malevolence of sublime scope and character. In the 1990s, IRAS (the Infrared Astronomy Satellite) detected a disk of cold dust orbiting Fomalhaut. This discovery corroborates other evidence that many stars are circled by material that can form planets. In 2008, scientists announced a visible planet for Fomalhaut. It was the first extrasolar planet visible to the eye in photographic images. Learn more in the above link, including how to see Fomalhaut. and Antares in the constellation Scorpius, the Scorpion, the Western Royal Star.